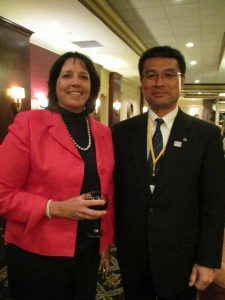 The mission of the Salem-Ota Cultural Exchange is to promote cross cultural understanding and friendship between the cities of Salem, Massachusetts and Ota, a borough of Tokyo. The cities of Salem and Ota have enjoyed a wonderful sister-city relationship for over twenty five years. The official sister-city relationship began in 1991 as an outgrowth of the century-old affiliation between Salem’s Peabody Essex Museum and the Ota Folk Museum. Through this unique relationship, hundreds of students, educators, cultural and business representatives, as well as municipal officials from Ota, have visited Salem as official participants in our sister-city program. As a result, other Ota residents as well as additional travelers from all over Japan, have also visited historic Salem as tourists and on private visits. Every year, citizens of Salem, MA open their homes as hosts to Japanese student and adult “Homestay” visitors. The City, the Peabody/Essex Museum, Salem State College, and the Salem School Department all cooperate with Salem-Ota club organizers to host our sister-city visitors with hearty international hospitality. Likewise, groups of Salem residents are welcomed and hosted in Ota each summer. Salem-Ota Cultural Exchange was formally organized in 2000 and is a 501-c3 non-profit organization supported by its members.